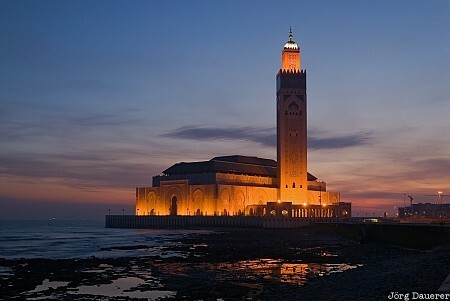 The floodlit Hassan II Mosque and its minaret at the coast of the Atlantic Ocean in El Hank near Casablanca at the blue hour just before sunrise. El Hank is in Grand Casablanca in northern Morocco. This photo was taken in the morning of a sunny day in March of 2010. This photo is part of the exhibition Blue Hour (October 2016). This photo was the image of the month in December of 2012. This photo was taken with a digital camera.